Jeb Bush called Donald Trump "a creature of Barack Obama" in the latest example of the former governor's ever-present frustration with the billionaire businessman during an interview with NPR. "But for Barack Obama, Donald Trump's effect would not be nearly as strong as it is," Bush said. The comments come as Bush continues his full assault on Trump over the past several weeks questioning everything from his rival's seriousness to intellectual prowess. However, Bush expressed optimism to NPR that "the emotion of the here and now" with Trump "will subside." "The point is that we're living in this reality TV political environment, where [Trump] fills the space by saying outrageous things [and] then people based on their emotions will express support for the sentiment, not necessarily the specifics, because there's none and then he'll backtrack," he said. "And he'll move on to the next thing and he fills the space." "I don't think I have to win any of them, because we're organized in every state," he said. "The good news is, expectations are low for me, and I'm definitely gonna beat those," he said. 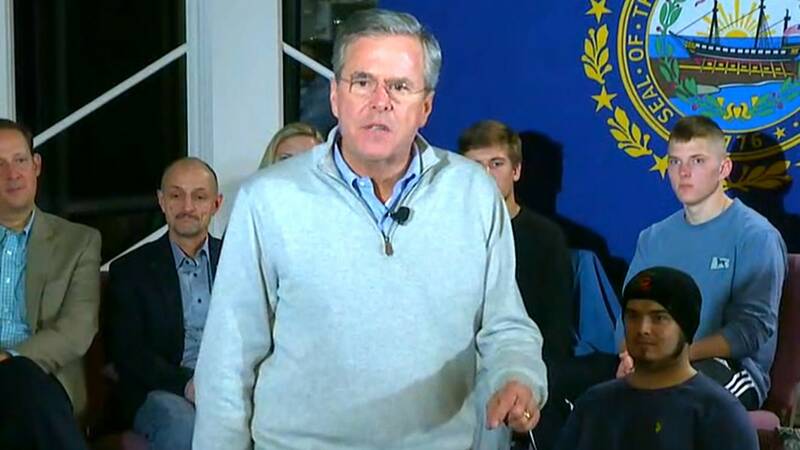 "I feel really good about New Hampshire, to be honest with you. Just — just the way it — it feels." On Wednesday Bush's campaign announced yet another reorganization that will shift staff from its Miami headquarters to early states. The campaign also canceled previously scheduled ad buys in a signal that the campaign could be strapped for cash. "We have a Super PAC that is advertising on TV at a rate that is comparable to any other campaign if not more and we're reallocating our resources to voter contact and a ground game that will be second to none," Bush explained to reporters. "So we're all in, the schedule will show that we're all in, the amount of people that are working and all the work that is done to be able now to convert these people into voters in a contested race."